The file Star Trek: RPG-X v.1.55 is a modification for Star Trek Voyager: Elite Force, a(n) action game. Download for free. 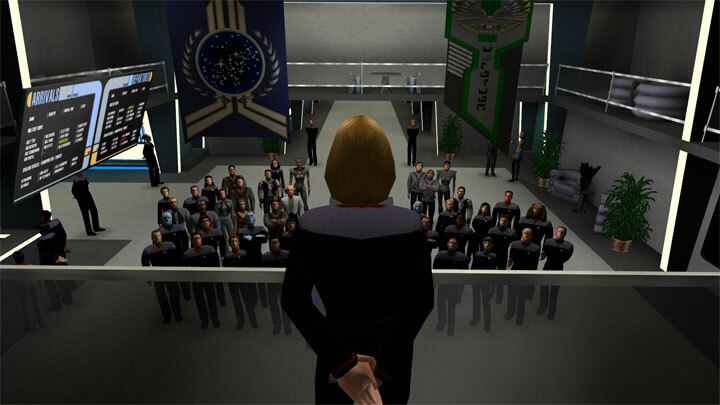 Star Trek: RPG-X is a mod for Star Trek Voyager: Elite Force, created by UberGames and expanded by LastOutpost community. In 2004, Ubergames released the RPG-X modification for Star Trek: Voyager - Elite Force, growing to become perhaps the most comprehensive interactive Star Trek roleplaying experience ever released. RPG-X transforms Holomatch from a frantic arena shooter into a sandbox tool set that enables players to share original stories inspired by a franchise spanning over fifty years and countless tales of starship crews exploring the galaxy on television. With permission from CBS and Raven Software, roleplaying community The Last Outpost has made Star Trek: RPG-X available for free as a standalone game. Star Trek: RPG-X has no predetermined missions, campaigns, or goals. Instead, in many ways a digital spin on the classic tabletop roleplaying game format, it is a massive, customizable sandbox that gives you the tools to create, run, and participate in your own Star Trek roleplays in a way not available in any other game. This project offers an installer.